Field to Cup is a tea discovery service that sends you 5 high-quality loose leaf teas to try every month (60-96 cups). Each box includes a steeping guide for each tea. 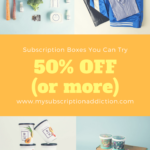 There are three subscription options: the Explorer for $14.97 a month for four teas (20-32 cups), the Discoverer for $27.97 a month for five teas (60-96 cups), or the Adventurer for $34.97 a month for four teas (40-72 cups). Choose between black or low-caffeine teas. This review is for the Adventurer – Black Tea, $34.97 a month, box. Each tea comes in a resealable pouch that has the tea description printed on the outside. The pouch shows the specific steeping instructions for each tea blend, and it includes mug vs teapot instructions for each blend. Coupon: Use code MSA20 to save 20% off your month-to-month subscription! The Products: Four 20g loose-leaf teas, one 40g “Customer Favorite” tea (select from Green, Black or Herbal/Wellness), and a steeping guide with preparation instructions. To get started you choose the Gift Instantly option on each of the subscription pages. We notify the recipient on the date you select, along with the gift giver’s custom message. This is especially wonderful for Dec 25th as you can send a gift on time without the box actually being there. Amazing for last minute gifting! The information insert includes a description of each tea, steeping instructions, and a place for you to record your thoughts on each brew. Also included were 9 lovely disposable tea bags for the perfect steep! I love this sub because they always send the most unusual and exciting teas! This little bag was filled with dried yellow mum blossoms and they were so beautiful! They brew up into a very fine tea with a hint of spice. I also used them as beautiful accents to my other brews this month. I didn’t add anything to this brew because I didn’t want to mask the sunny bright flavors of the flowers. The flower trend continues in this brew is made from 5 year aged white peony. It tastes of green things and sweet hay and summer fields to me. added a little bit of raw sugar but no cream, as I was worried about masking the delicate flavors found in this brew. I have never had anything quite like this! This tea isn’t sweet, but it has an unmistakable sweet fruit scent that clings to it, giving it a lot of complexity. That sweetness is balanced out with the very deep green sort of flavor that tastes of dark leaves and chocolate. I added some raw sugar and a little splash of almond milk to this cup, which only added to its depth. This tea comes from the leaves of 500-year-old trees in Northern Vietnam! These are some special leaves. The flavor is bright and smooth, and it is such an easy tea to drink at any time of day. Add cream and sugar or leave it be either way, it will be delicious. This tea is a labor of love from a husband and wife team in China. They handpick the leaves, hand roll them, and then leave them in the sun to dry. After, they are pressed into little cakes and then left to ferment. They are then aged. You should really treasure this tea! You can enjoy it now and let the rest age for an even more complex and special flavor later on. The scent to me is of almost pure leather, and it has this ancient flavor to it that has to be from the fermentation. The closest memory I can grab from it is of being in the stables, saddling up my favorite horse, surrounded by leather tack and fresh hay. This was so special. Verdict: Field to Cup was extraordinary for me this month. I was so happy that there was not a holiday-ish tea or chai in sight! Instead, we got a heavy dose of flowers, ancient leaves, and hand made techniques. Instead of spices, we experienced fresh hay, leather, and the feeling of the sun. In the dead of winter, I really needed this! This month easily goes down as my all time favorite so far from this sub, and I highly recommend you see if you can get your hands on this box. It sums up the very best of this subscription, at least in my book. Can you still get this box if you sign up today? It may be possible to receive January as your first box! And learn more about gifting Field to Cup instantly here! Value Breakdown: At $27.97 per month, you’re paying between $0.29- $0.47 per cup of tea depending on how much you brew at a time. That is a lot of tea goodness! Check out all of our Field to Cup reviews to see what types of teas you can expect from this subscription! What do you think of the January Field to Cup? What’s your favorite tea this month? This is not the Discoverer sub. This review is of the Adventurer for $34.97. Thanks for your great review! I bought this box after reading this and Shirley kindly pointed out I had the wrong box if I wanted yours. I am enjoying every tea here! Such unusually interesting flavors! The herbal tea with the trippy mum blossoms is just awesome! Thanks Anita! Yes, this box is our Adventurer 🙂 We look forward to sharing our February box with Megan, I hope you’ll come back to check out her review!